As was the case in many early copper mines, the miners at Central were lowered down to the mine in the same type of rail car that was used to raise the rock from the mine. This car, commonly called a skip, was raised by means of a wire-rope that was attached to the skip at one end and to a large hoisting engine at the other end. The hoist engineer operated the hoist engine that raised and lowered the skip. On Monday, April 22, 1872, the wire rope at Central snapped as men were being lowered into the mine. Most of the thirteen men who were riding the skip were Cornish. This poem, “Sad News from Central Mine” appeared in the newspapers in Cornwall some time after the accident. While it was a poetic way of announcing and commemorating those who died it also provides a glimpse of the hard life these Cornish miners faced as they toiled in the “foreign land” we now call Central. Of death in that distant clime. Down the shaft were lowered apace. This photograph shows a man car used in the Quincy Mine during the 1920’s. 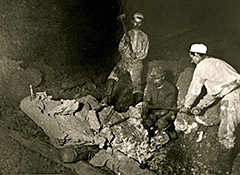 The ‘skip’ mentioned in the poem would have been a car with larger sides that normally would have carried copper ore to the surface but was also used during that time period to lower men to the mine workings underground. And it fell with an awful din. Thomas Bone was killed stone dead. As they stood and heard the same. ‘Twas to several a funeral knell. Not a hair on their head was harm’d. Torn-off flesh and splinter’d bones. 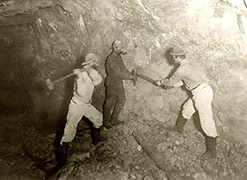 This classic photo shows two miners “Double Jacking” to drill a hole by candlelight. 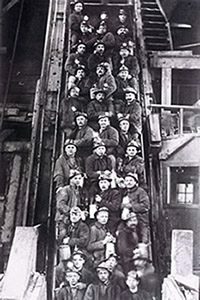 Many of the miners at Central were of Cornish descent and thus were often called “Cousin Jacks.” While none of these photographs were taken inside of the Central mine they are representative of the mining done during the time of the tragedy at Central. (MTUCCHC). Where soon assembled a crowd. Their bodies all bloody and cold. Where they sought for the precious ore.
And sorrow and sighing were there. There proceeded a mournful train. In that foreign grave did lie. Who now their sad fate bemoan. Thomas Champion a young man’s name. All three from Cornwall came. And Edward Trezise was his name. John Rowe from Camborne town. Of their comrades stricken down. How sad in that land alone. They liv’d with a love sincere. 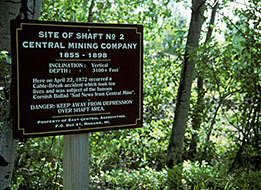 This sign was erected to mark the spot where the tragedy occurred that sparked the poem, “Sad News from Central Mine. Each one with his family. The Savior to meet. —Amen.